If you’re looking for a piece of custom furniture to anchor your child’s playroom, this Rubik’s cube chest of drawers is just the thing. [Makendo] went the extra couple of miles on the project, building the entire thing from scratch and adding one clever feature after another to make it something special. It’s made up of three plywood boxes, open on one side to accept a plywood drawer. The drawers were carefully fitted so that it is difficult to see which side is actually the drawer face. [Makendo] even routed a hash-mark of grooves into each face of the cube to make it look like the seams that make up the 9×9 grid of colored squares. Speaking of those colors, the “stickers” themselves are made of 1/4″ plywood and are not permanently affixed. Each is held on with a magnet plus a pair of dowels to keep it from spinning. This way you can rearrange the colors as often as you please. Each layer of the cube spins thanks to some lazy susan bearings. [Makendo] didn’t want to add too much distance between the different modules so he routed out each side to fit the circular hardware. As a final touch, the drawers themselves can be locked in place using a dowel underneath one of the colored squares. We’ve embedded a video of the cube at play after the break. Very nice project, and high quality. Although a pretty cool carpentry project, I must say this is not a hack. Really? You *must* say that? But it’s the best retort to the tiresome, not a hack, I have read yet. cool! looks like a smooth operation also! This is a great project (and I must agree with [dave]; it’s not a hack, but I’m glad it was featured). 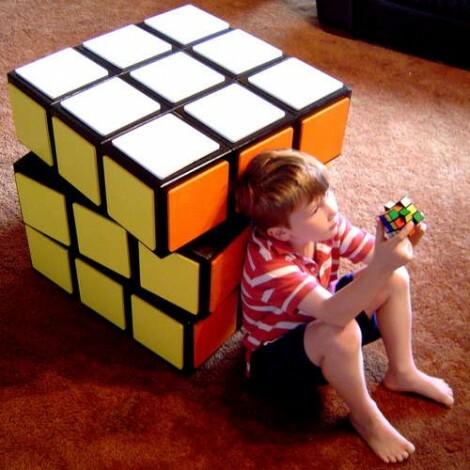 My brother’s a huge Rubik’s fan and would love one of these. I Love this? Can I somewhere get information on how to build this,or somewhere to go with questions? I’ ve got some experience in making furniture, but this seems soooo way much more awsome! The article links to an instructable with detailed build instructions. Kid’s room? Shoot, I want one for MY room! Nice…but why do I get the feeling that the kids are already tired of it and back to playing video games? Is it not a 3×3 grid, not a 9×9 grid?